Hello everyone, and Happy Wednesday! 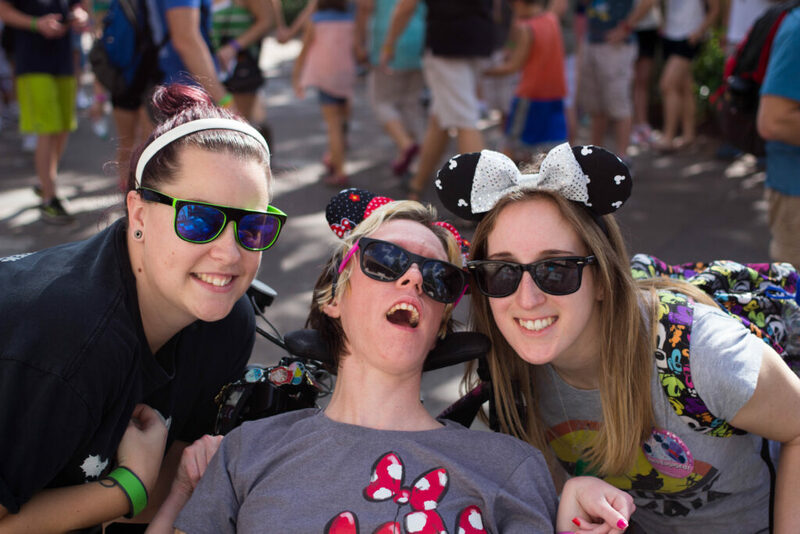 Since I was recently in Walt Disney World, I thought I would share a bit about our experiences travelling with my sister (who is in a wheelchair). I’ve shared some of the accessible ride vehicles if you’ve watched my Disney Vlogs, and I tried to capture as much of that as I could. I’ve mentioned before that we don’t go to Universal Orlando because of their policies for people with disabilities, and how Disney is SO much better. Today I thought I would share some of the things we experienced on our trip. As you can probably tell by the title of this post, it was all good! 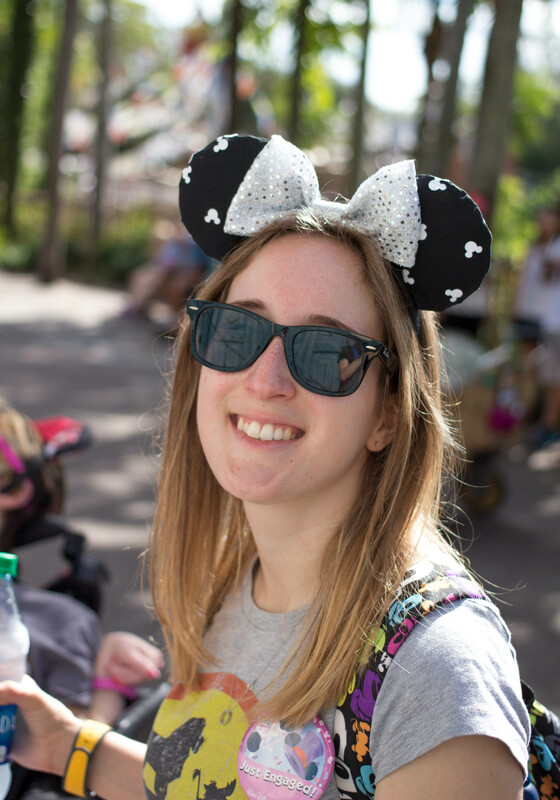 Because there is one person in my life that allows me to learn all about this side of Disney, I thought I would take a minute to introduce my sister, Alexandra! Alex has Cerebral Palsy, and has her own custom (green because she loves the show “Arrow”) wheelchair. She can’t walk or talk, or use her arms in the way we can, but she has a computer she uses to communicate. Alex is also great at using facial expressions to get her point across. She needs someone to help feed her and lift her, but she is always happy! Alexandra is on a puree diet, meaning her food needs to be blended into a hummus like consistency. Keep in mind she doesn’t have the best grammar, but you can definitely understand what she means! We hadn’t been to Walt Disney World with Alex 2012, so we weren’t sure what might have changed since our last trip. Luckily, the only thing that changed was the system used for guests with disabilities to access attractions. We had warning about this, and I had read all I could about the new system to be prepared. The old system was a card that had a stoplight on it, red, yellow or green. Our was always green which meant we would just walk up to a FastPass line as go straight through. Now things are a little bit different. This was the first thing I knew I wanted to take care of when we arrived in Magic Kingdom. The urge to see Cinderella Castle won out, but we headed to guest Services shortly after. 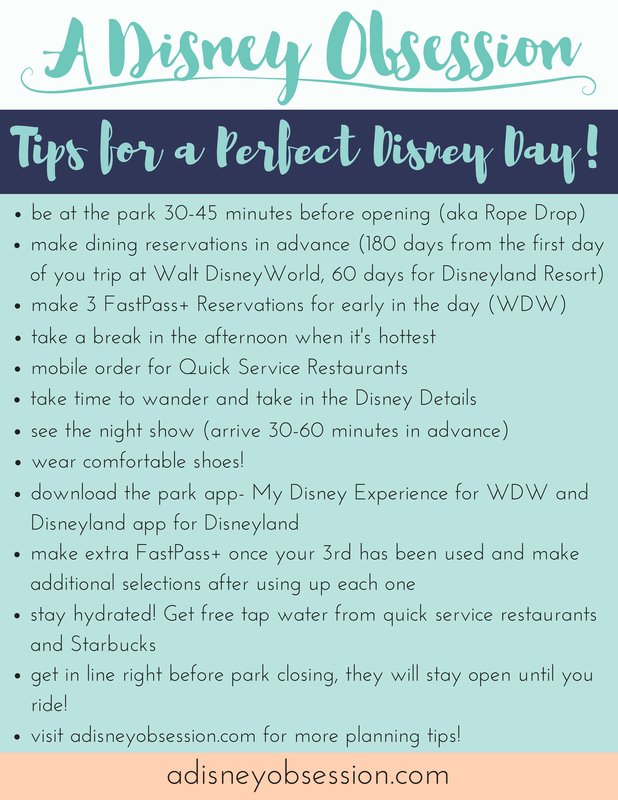 When you visit Guest Services, you mention that you want to set up the Accessibility Services, and they will take a picture of the guest with a disability, scan the magic band of that person, and everyone in your party. Once that is done, you are good for the duration of your trip! The new system uses “come back times” based on the wait time, so you can spend the time doing something else. I think for people with sensory issues or those that have trouble waiting in line for a long time, this is a great solution. The best thing about it in my opinion, is anyone can go to get a time. I would be a “runner” (I’m a little aggressive when it comes to getting things done in Disney :D) and go to a ride, say I would like a come back time, they would scan my band, and say when we could come back. If their scanner wasn’t working, they would hand us the card below. When it was time to go back, the person the “account” is associated with needs to scan their band first, so I would take Alex’s off her wrist (it’s difficult to line her arm up with the touch point for FastPass+), and then everyone else could enter. the time does not expire! That’s about it when it comes to the new program! 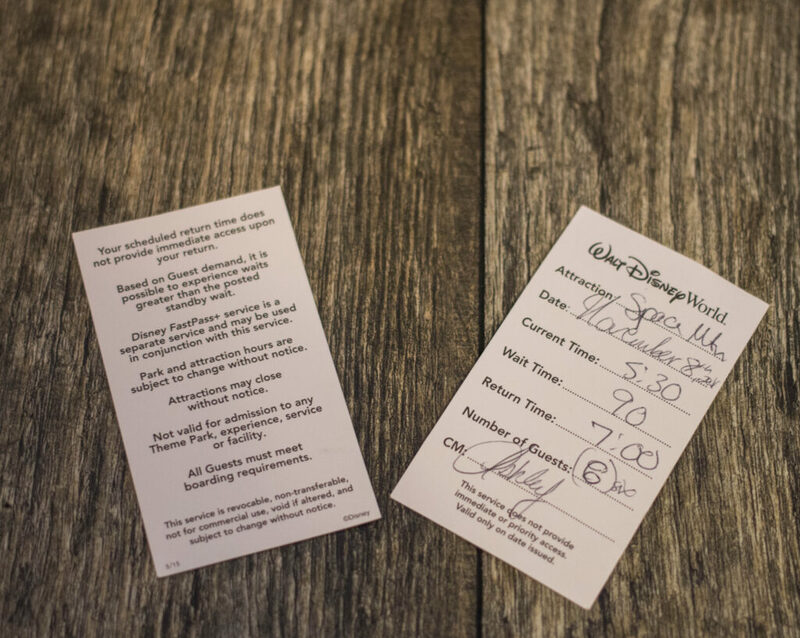 Walt Disney World was actually the first place we ever reserved an accessible hotel room! We generally request a room with a roll-in shower because that works best for us. I show some of the differences in room in the Disney Vlogs that are currently running on Friday’s on my channel. Alex doesn’t utilize the accessible buttons herself, but it does help getting her out the door! When I made our dining reservations for our trip (right when the window opened up), I made a note of an allergy or dietary restriction. When we arrived at a restaurant, the little print-out of out reservation had a red ALLERGY stamp on it, so either a manager or chef was required to visit our table. I will admit we didn’t say anything during our first meal. But, at Tusker House on Day 2, we were so impressed when we explained to the chef that Alex is on a puree diet. He said “okay, what does she want? We’ll make it happen”. Normally in a restaurant they say they don’t have a blender, so this was AMAZING! She loved getting to eat whatever she wanted in the consistency that was easiest for her. It was such a great experience for us, and it definitely felt like a weight had been lifted, because I was definitely worrying about it. 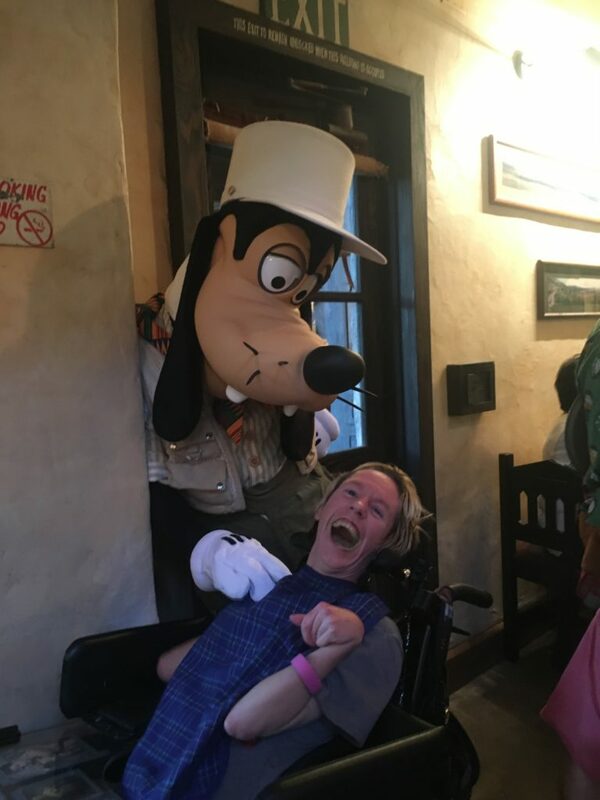 Goofy LOVED Alex at Tusker House! This was our first time staying at a Monorail loop resort, and it was great! 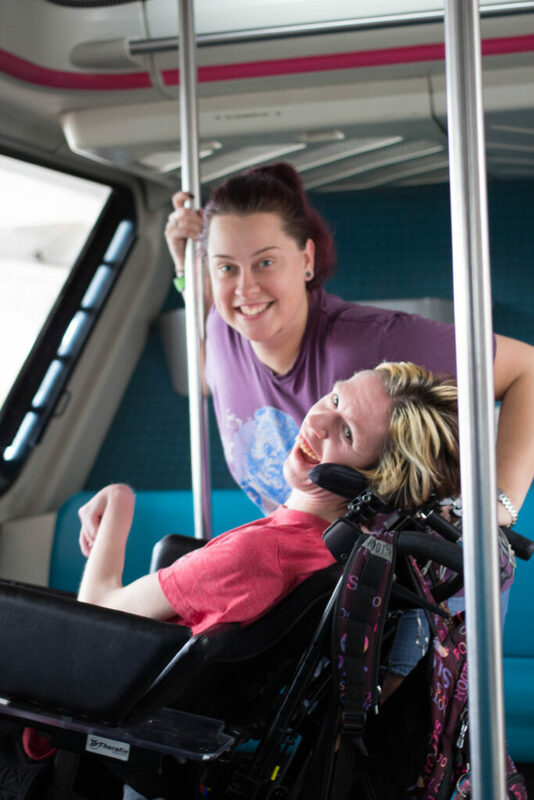 The monorail was much easier for Alex because her chair doesn’t have to be tied down, and the Cast Member always asked where we would be getting off so someone could assist us. The two(?) time we took the bus, it was easy, and short! The Magical Express is also wheelchair accessible, so we just had to wait to the side for a minute before boarding, and they took care of us first. Transportation at Disney when it comes to Alex was top notch! This is Alex and her worker Megan. Space Mountain is the only attraction Alex can’t go on, because the seating is single file. The version in Disneyland isn’t so she could ride it there! The Peoplemover ramp cannot accommodate a wheelchair, so if Alex wanted to ride we would have to lift her. We didn’t this time because we weren’t sure how long the line would be when we got up there, but she was fine with that! When we went to ride Peter Pan’s Flight the Cast Member had to ask us if we could carry Alex down a ladder in case of emergency. That was something I hadn’t even thought about, but because the ride track is above you, it makes sense! If you’d like to hear a little more about our experience (I think I explain it better talking than in text), check out the video below! 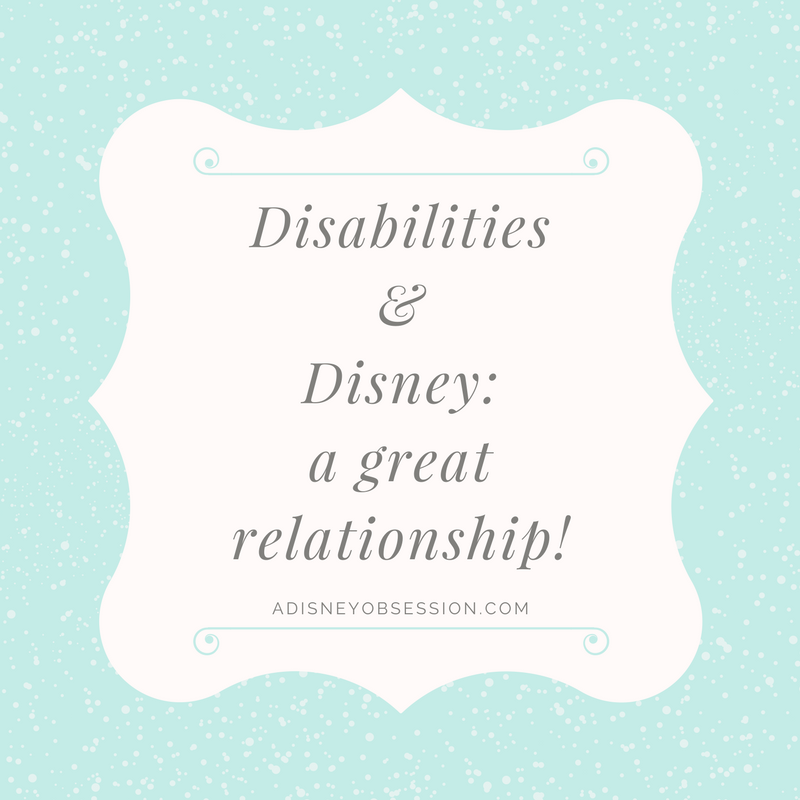 I hope this post helped to show how accessible theme parks can be, and part of why we love Disney so much! If you have any questions about anything I mentioned in the post, please leave a comment below and I will do my best to answer!